De ellos habíamos presentado hace tiempo el disco "Aniversario", en un proyecto que nace de Javier Girotto, músico argentino radicado en Italia y que podría estar en una sección denominada "Listado de músicos argentinos haciendo lío en el exterior" o algo así, y si lo siguen seguido habrán visto en este blog que el listado es considerablemente importante. Como dijimos en el primer post, este proyecto entra dentro del terreno jazzístico aún siendo de raíces netamente tangueras, inspirado en sus propias raíces musicales pero mezclado con la modalidad típica del Jazz, creando un... ¿nuevo? terreno musical. Bueno, le sacamos lo de "nuevo". Mejor dicho prepara su propia canchita de fútbol para la picada antes del asado. Aires Tango entrega un repertorio de música original en su progresiva evolución, tanto por la naturaleza improvisada como por el suministro continuo de material musical. Cabe destacar la presencia de un cuarteto de cuerda en cuatro temas y la participación delk acordeonista Antonello Salis en dos tracks. The band has been founded in 1994 by argentine saxophonist and composer Javier Girotto. Melting his musical roots with the Jazz idiom he created a new form of improvisational expression. Aires Tango performs a repertoire of original compositions in continuous evolution, following the path of the great Astor Piazzolla and conjugating it with the improvisation forms peculiar to Jazz music. The musical origins and experience of every single member of the band function as a further source of inspiration and add up a new creative color. In every live performance, Aires Tango always gets an amazing feedback from the audience, also because of the nature of their melodic approach, such lyrical and universal. In ¡¥95 they have been featured on two different soundtracks: for the theatre play ¡§I Testimoni¡¨ with Alessandro Gassman and Giammarco Tognazzi, and in the movie ¡§Banditi¡¨ with Ben Gazzarra and Lumi Cavazos. In ¡¥96 they recorded their first CD ¡§Malvinas¡¨ (from the argentinian denomination of the Falkland Islands). 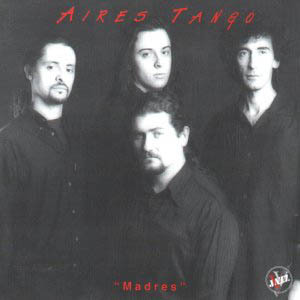 In ¡¥97 they released their second CD titled ¡§Madres¡¨, recorded for BMG - Rca Victor. Keeping the same stylistic shape, they further progressed in their musical exploration using different timbres, such us a string quartet and the bass clarinet. Two composition featured guest accordion player Antonello Salis. Between ¡¥96 and 2000 the band played in a variety of Jazz festivals, such as JVC Jazz Festival in Rome and in Turin, Koper Festival, Fano Jazz, Roma Jazz Festival, Atina Jazz, etc. Besides, they collaborated in live performances with many guests, such as Paolo Fresu, Enrico Rava,GianniCoscia, Antonello Salis and Peppe Servillo. Aires Tango¡¦s third CD (released in Spring ¡¥99) is titled ¡§Poemas¡¨ and it is dedicated to the great latin-american writers. Their fourth CD, ¡§Cronologia del ¡¥900¡¨, has been released in Winter 2000. Fifth CD (named ¡§Origenes¡¨), released in Fall 2001, is a journey through the whole work of the band, a sort of summary after 300 live concerts and more than 40 original compositions. The music of Aires Tango can be called ¡§treated Tango¡¨, from the fusion of Tango melodies with Jazz improvisation. Starting from the lyrism and inspiration typical of argentinian Tango, they refuse its strictest traditional form and introduced the improvisational item; by doing this they achieved a great freedom of expression and join ideally together past and present. Javier Girotto (Soprano and Baritone Saxes, Bass Clarinet): he graduated at Music Conservatory in Cordoba, Argentina and at Berklee College of Music in Boston, Massachusetts. He played with many artists of the international jazz scene, such as Bob Mintzer, Steve Turre, Roberto Gatto, Rita Marcotulli, Hal Crook, George Garzone, Bob Moses, Bill Pierce, Danilo Perez, Roy Hargrove, Randy Brecker. A very prolific compositor, he is also the leader of various ensembles (Tercer Mundo, Six Sax, Girotto Quintet). Alessandro Gwis (Piano): very active both in jazz and in commercial music, he collaborated with Antonello Salis, Gege Telesforo, Gianni Morandi, Maurizio Giammarco, Roberto Gatto, Danilo Rea, Stefano DiBattista, Kurt Rosenwinkle, Cinzia Spata, Carolina Brandes.He is also a very talented compositor, both in the song-form and in jazz compositon. Michele Rabbia (Percussion): very imaginative and creative, he worked with many jazz artists, such as Giancarlo Schiaffini, Michel Godard, Dominique Pifarely, Antonello Salis, Sainkho Namchylak , Flavio Boltro, Gianluigi Trovesi, George Garzone, Toquino , Paolo Damiani, Stefano Battaglia, Irio De Paula, Nicola Stilo, Rita Marcotulli. He also played, as a classical percussionist, with the Orchestra di S.Cecilia and the Orchestra dell¡¦Opera di Roma, and recorded many soundtracks as a Solo Artist. Marco Siniscalco (Electric Bass): he graduated at Berklee College of Music in Boston. He played with many artists both of the jazz and pop scene, such as Gege Telesforo, Ben Sidran, Tony Scott, Claudio Baglioni, Gianni Morandi, Paul McCandless, Stefano DiBattista, Nicola Stilo, Dave Liebman, Randy Brecker. Besides, he worked as a session-man with the RAI-TV Orchestra, accompanying among the others George Benson and Michael Bolton. La música de Aires Tango refleja en sus melodías rasgos tangueros junto con la improvisación del jazz, el resultado está menos sujeto a los cánones del tango tradicional y es terreno fértil para una improvisación inspirada Jazz pero con el alma y la expresividad tanguera; otorgando emotividad y libertad. Da questo tango è nato il tango e come un grido dal fango poi si è sollevato verso il cielo" scrive Discèpolo ed è in questa maniera che prende piede il secondo lavoro degli Aires Tango Madres, Las Madres Argentinas, con un featuring d'eccezione:Ruben Chaviano Fabian e Marcello Sirignano al violino, Silvia Cioffi alla viola, Giuseppe Tortora al violoncello e con la partecipazione straordinaria di Antonello Salis alla fisarmonica. Subito un caldo e tormentato tango di Ciudad De Frontera ci fa immergere la mente nel pieno folklore argentino, un eccezionale brano nel quale si alternano momenti di estrema rilassatezza a momenti di massima tensione; arriviamo a Madres De Plazo De Mayo, un brano incantevole dove interagisce finalmente la sezione d'archi arrangiata da Paolo Vivald, e dove troviamo un grande Javier. "Non tutte abbracciarono il fulmine arcangelo di lacrime e baci. Non tutte poterono riconoscere i loro figli. Rinchiudevano nel cuore un paradiso il cui ingresso custodiva un grido". Scrive Angel Amezketa Lo spazio è riservato anche all'ospite d'eccezione, Antonello Salis, il quale in Mi Bandoneon ci regala una meravigliosa e sublime performance.Con Pichuco si torna a quella languida passione che porta la firma di J. Girotto, una potente fuga egregiamente arrangiata da Marco Siniscalco. A metà del percorso ci viene proposta una calda e malinconica ballata, Foglie D'Autunno, ipnotico brano di grande sensibilità artistica, anche qui l'arrangiamento degli archi è opera di M. Siniscalco.Torna a trovarci in Mariao il buon Salis, e non passa di certo inosservata la sua presenza. Il sublime ed egregio arrangiamento d'archi di Pino Iodice, ci porta a Passione In Fuga; brani d'eccezione che solo persone di una grande sensibilità artistica come gli Aires Tango possono regalarci! Il disco si conclude con El Dia Que Me Quieras, un brano di C. Gardel - Lepera interpretato stupendamente da M. Siniscalco e J. Girotto. Un trabajo fascinante, en el que los ecos del pasado se mezclan con las instancias de la nueva búsqueda del lenguaje musical. Este abrazo de contextos diferentes logra fusionar estilos en un torbellino de emociones caledoiscópicas.